New lightweight FM trailer hitch GB - Miata Turbo Forum - Boost cars, acquire cats. More details on the hitch here. I think this thing is perfect for a lot of the MT.net members who do a lot of track work. We're running an introductory group buy on the hitch so we can buy a larger volume. If we can get 10 people by the end of the month, we'll be able to drop the price to $199. The photos of the actual part are the prototype. Mark made some small improvements for lighter weight and more strength, as seen in the rendering. Cool Part Keith. I went to buy it, but saw NA fitment only. Good luck with the GB. I'll watch for an NB version. Good timing, we were just talking about it! It's NA fitment only for a couple of reasons. It's a much easier one to design than the NB, and Mark at Paco has an NA We're talking about an NB and NC version, but I don't have any details. will it clear the rear skirt if you have one? Fits 1990-97 models only. If you have the R package rear skirt, you will need to cut a notch to clear the ball mount. I never had the rear skirt, but I liked that the receiver dipped low enough to clear it if i were ever to add it. Nice timing! Hope the buy gets put together. If I don't DIY something quick I'll definetly be in. Even if the buy doesn't go through, we'll have these available for $225. I think we'll have an optional ball mount that gives clearance for the rear skirt. I don't know if it will be made standard due to the loss in ground clearance. Strength won't be an issue, that part is way overbuilt. Is there any idea what a standard Miata hitch weighs? Please don't make me get the wrenches out. I also need a weight on this item for NASA TT classing ASAP because I'm trying to email the NASA director yesterday. Is there any idea what a standard Miata hitch weighs? Please don't make me get the wrenches out. Curt's specs for their version of the hidden hitch list a weight of 21 lbs. Not sure if that includes the removable part or not. Screw all that noise, I'll buy it. I ordered through the website as suggested. Last edited by hustler; 01-09-2011 at 05:02 PM. The removable part adds a LOT of weight. However, that's not important unless the trailer is coming on the track with you. Actual weight of our receiver is 8 lbs. You have to remove 3 lbs worth of tie-down hooks to install it, thus the total weight gain of 5 lbs. Just in case NASA cares. 95% sure I'm in for this. Just need to see how my finances are at the end of the month. Can I finally fit one of those rear "SM style" tow hooks back there with this mounted? 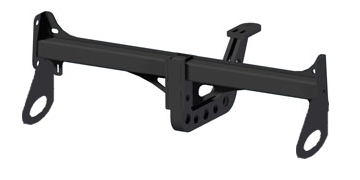 Or is there any chance that the hitch could be made with tow eyes integrated into the mounting plates for example? I think this would be of interest to anyone tracking their car, which is probably a large percentage of people who'd be buying these hitches. See attached crappy photoshop for general idea. Another possibility would be to take a standard tow eye and cut a square notch so it slips over the horizontal hitch tube on the inside of the end plate. Probably would then want to weld the two together so the tow eye isn't rendered too flimsy by notching it. If you had a welder and more effort than I, it could be done. Or replace the ball hitch assembly arm thing with a toe hook on a pin. Pull ball/drop hitch, replace with tow hook, not get yelled at by NASA people. Right now I'm pulling the hitch, then bolting in the tow loop. There's also the option for romantic attachments. Update - we've now tweaked the design of the ball mount so it can be adjusted for height. The lowest setting will clear the R package, and you can now match your hitch height to your trailer. This will be standard on all the hitches, including any already ordered. A tow hook attachment for the receiver? Interesting idea.